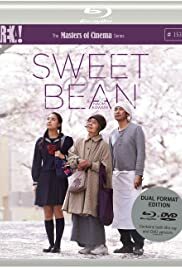 The “Sweet bean” movie begins with a sequence of the main character Sentaro (Masatoshi Nagase) walking up to the roof of his apartment building for a cigarette. He walks out of his apartment, up the steps, smokes, walks down the steps, and back into his place. Kawase’s patient camera, keen to silently observe motion and thereby her characters’ interaction with their environment, likens this doubled movement to breathing. The story is shaped by a similar oscillation: that of night and day. It revolves around Sentaro’s small shop, where he sells dorayaki, a mouth-watering Japanese dessert consisting of sweet bean paste (the “an” of the original Japanese title) sandwiched between two pancakes, and it mostly develops through a series of days at the shop. Every day the shop is populated by the same three high school girls and Wakana (Kyara Uchida), a high school age girl whose mother pressures her to work instead of go to school. Eventually Tokue (Kirin Kiki), a blissful elderly woman with mysteriously disfigured hands, shows up at the shop looking for work and, despite Sentaro’s initial reluctance, her delicious bean paste wins him over. They start to collaborate on the dorayaki; Sentaro makes the pancakes and Tokue the bean paste, making a popular product which brings many customers. A scene in which Tokue is left to man the shop alone heavily emphasizes their need for each other to make the perfect dorayaki, as Tokue struggles to flip the pancakes and burns many of them. A twist in the middle of the film reveals that Tokue has leprosy, a secret that spreads and causes the shop’s business to vanish. We also learn of a mysterious incident in Sentaro’s past which caused him to be somewhat alienated from society. After this twist, the film begins to develop its ideas about the characters’ respective prohibition from society. Wakana, herself alienated from her peers because her mother won’t let her attend school, looks through a book of photographs of majorly disfigured lepers which ends with the quote, “We, too, want to live in society where sun shines.” While this development does sort of come out of nowhere, it doesn’t feel out of place. It unifies the presence of the primary trio of characters and contextualizes Tokue’s deep connection with nature, keeping her exclamations that “the trees are waving their hands” and commands that Sentaro must “listen to the stories the beans have to tell” from coming off as saccharine. This characteristic rather comes to signify Tokue’s ostensibly artificial social relationship with the natural world as a response to her inability to create social relationships in the human realm, due to her social prohibition caused by her disease. All the main characters of Sweet Bean are social pariahs, and the story suggests for a while that their cooperation can yield a lovely fruit. Yet their rejection from society ultimately signals a deterioration of their dynamic. We learn the toll that Tokue’s long history of rejection because of her disease has taken on her, and witness the dissolution of Wakana’s already fractured family life. After the characters’ outsider status becomes increasingly apparent and begins to show significant effects in the film’s second half, the film ends on a much more melancholy note than where it began. Despite the message and significance of the story, it’s important not to overstate Sweet Bean’s drama. The narrative leaves an impact but is presented so lightly and serenely that it passes like a gentle breeze. The film rather foregrounds the images and its inviting and tranquil mood with its long and frequent pillow shots of cherry blossoms and sparsely populated town streets. A protracted (in the best way) sequence which depicts Tokue’s meticulous method of making the bean paste is almost instructional — she narrates every step to Sentaro — yet the sequence’s supremely delicate construction makes it entrancing. It appears as though Kawase is taking care to impose as little as possible upon the scene, just as Tokue and Sentaro carefully stir the pot so as to not crush any of the sweet beans inside.